Ira Glass, the host and creator of This American Life and one of the most revered journalists in the country, and Mike Birbiglia, the popular comedian, writer, and actor, who makes regular appearances on This American Life, are two beloved figures who are embarking on their first film: the charming and off-the-cuff Sleepwalk with Me, which Birbiglia directed and co-wrote with Glass, Seth Barrish, and Joe Birbiglia (his brother). It’s based on the comedian’s autobiographical one-man show about his bouts with sleepwalking, a stalled relationship, and a going-nowhere-fast career. The film premiered at Sundance to rave reviews and even won an Audience Award. Will that translate to actual audiences showing up to actually see the movie? They’re about to find out. The two men sat down recently with Vulture to talk about selling popcorn, the advice they got from Matthew Broderick, and feeling like little fish in a big sea. So what’s this I hear about you guys taking tickets and selling popcorn at the IFC Center? Glass: We’ve been told that the first week of release is so important, because how you do determines whether other theaters will book you — at least when you’re a film our size and not Joss Whedon. So we need to do well. And we thought we’d do everything we could think of, including taking tickets and making the popcorn. Birbiglia: This is our first foray into the movie business. The movie was reviewed well at Sundance, and we won some awards and things like that. At the time, we thought, Well clearly, this will make it successful. And since then it’s been this rude awakening of people telling us constantly how the movie is not going to make money, how we’ll be lucky if we recoup our investors. It must be an adjustment to go from being big fish in little ponds to little fish in big ponds. Glass: That’s the most poetic way to put it. It’s weird to be beginners again. So, this is the first film for both of you, but throughout the years, I keep hearing that “Ira Glass is writing a screenplay” or “He’s working with this or that director.” What happened to all those other projects? Glass: There was one that I didn’t have much hand in, a movie based on a story from the radio show, called Unaccompanied Minors. Paul Feig, who did Freaks and Geeks and Bridesmaids, made it into a film. I wasn’t involved in that. Happily so. Because Paul and these other people knew exactly what they were doing. But now we have about half a dozen films that are in development with different directors — one with Errol Morris, one with Marc Forster — and in various stages. But this is the first screenplay that I’ve had produced. Glass: Yeah, we were in “development” at a company. A very good company, too. And they said, “We respect that this is the movie you want to make, but we don’t want to make this with you.” And in the most friendly way, we shook hands and walked away. Was it hard to achieve the naturalistic, direct-address quality of the film? It reminded me a little bit of two other films with ties to stand-up and radio: Private Parts and Annie Hall, specifically. Birbiglia: Those are probably two of the ten movies that I emulated. Glass: Plus The Hunt for Red October. Birbiglia: Because the audience won’t trust you. So, Matthew said that against his instinct as an actor — which is to be natural — he had to maintain this gaze. We’re so used to romantic comedies and their redemptive endings where everybody comes back together. But this is a relationship movie where the happy ending is that they decide they shouldn’t be together. 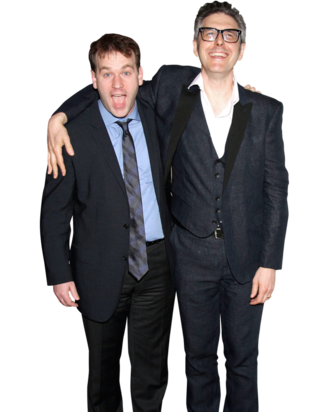 Birbiglia: He was going to propose at the movie. Glass: “… And I’m going to bring my whole family.” Dude, no. This is not the right movie for that move! Mike, you’ve adapted this story into a book, a show, a This American Life episode, and now a film. Is there a different “hump” before each of those — a different challenge with each? Glass: It is weird, actually, now that you say this. You’re telling the same story over and over, and each time you do it, it’s insanely difficult to figure out how to tell it. Birbiglia: I’m going to be done with this story as soon as we’re done with this movie. This story has ended up being my training wheels into all of these different art forms. And the one I’ve landed on is film. I’m going to end up making twenty films, if people let me.